And in the southern NSW town of Prospect, four ladies bereft of men have problems that threaten to overwhelm them. Beautiful Louisa Worthington, whose dashing husband died for King and Country, is being ruined by the debts he left behind. Young Maggie O’Connell, who lost her mother in childbirth and her father to a redhead, is raising her two wayward brothers and fighting for land she can’t prove is hers. Adelaide Nightingale has a husband, but he’s returned from the war in a rage and is refusing to tackle the thieving manager of their famous family store. Pearl McLeary, Adelaide’s new housekeeper, must find her missing fiancé before it’s too late and someone dies. Thank God these desperate ladies have a solution- a part-time husband who will rescue them all. To find him, they’ll advertise. To afford him, they’ll share . 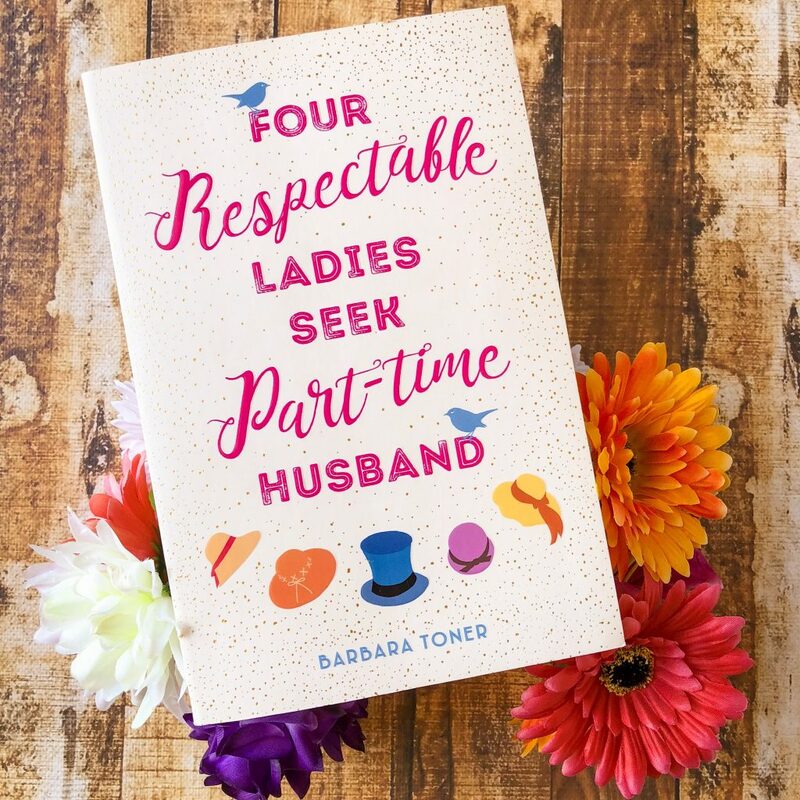 . .
Four Respectable Ladies Seek Part-Time Husband by Barbara Toner is a historical fiction novel set in the small country town of Prospect in 1919. The war and the Spanish flu are over, but four women in town are struggling. They each face different dilemmas and they need help. Louise needs to clear the debt left behind by her deceased husband, Maggie needs help fighting for land, Adelaide’s family store is being pilfered by their manager, and Pearl’s fiancé is missing and she needs help tracking him down. These troubles mount on the women each and every day, and they don’t have support from the town. They advertise for an external party — a part-time husband to help solve each of their problems. Enter Martin Duffy. This is a novel about female friendship and identity. At a time where women were laughed at or cast aside, these women team up to take charge. They refuse to roll over and let others force them to give up what they want. These woman are confident, decisive and ballsy. At first, they don’t like each other. They have preconceived notions about each other, and so there are a lot of arguments and disagreements over the course of the novel. But, over time, they bond and put aside their differences because they both want and need the same thing. Four Respectable Ladies is charming and witty, filled with all sorts of characters. However, the novel fell flat for me. I think there were too many characters, contributing to an overly complicated and convoluted plot. At times, it was hard to follow the storyline, and we didn’t spend enough time with each of the four women to really warm to them. At certain points in the novel, the women started to blur together. Additionally, Martin Duffy was quite an underwhelming character, not really dominating the book like I thought he would. Instead, I felt like he didn’t make enough of an impact in the town and he was quite disappointing. I was initially drawn to this book because of its gorgeous cover. It captures the flirty, fun nature of some of the characters, whilst also making it clear that it’s historical fiction. The setting has been captured well, highlighting that period in history where the war is over and yet life is not perfect. People are still recovering from the war, and they’re learning how to move on with their lives. The biggest strength of this book was actually the secondary characters, not the four women. I particularly liked Florence Mayberry — the Mayor’s wife — who provides quite a bit of humour for the reader and whose relationship with her husband is entertaining to read. Additionally, Barbara Toner has done a fantastic job of capturing dialogue. This book is really dialogue heavy, but Barbara illustrates all of the individual voices really well and so the conversations don’t get muddled. It was easy to follow who was speaking, even when there were multiple people in one scene. I recommend this book to readers who love historical fiction, but know that this isn’t a typical historical fiction novel. Romance doesn’t drive the plot, and there are many many characters. It’s really a book about a town of people, not just four women and one part-time husband. This isn’t my favourite book, but I do think there is a market for this. Many readers will love the town of Prospect, and all the drama within it. But we’re not the only experts in what you should sell. You can become an expert yourself by using free tools like Google Trends. This is the go-to tool for investigating search volumes and finding specific search trends.